Allison Tremain and her Spyhopping reduction cut linocut were selected as the featured art & artist for the 2012 Pacific Rim Whale Festival, March 17-25, 2012. Her work is featured at Uclulet's Mark Penney Gallery. Gotta get me one of those posters! 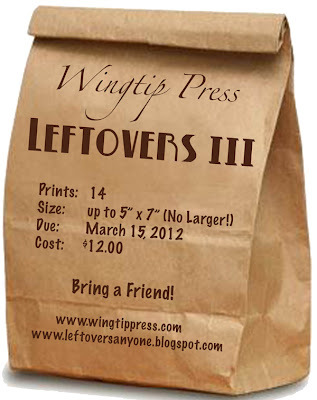 Time for this year's edition of Leftovers at Wingtip Press in Boise, ID. Size: Up to 5" x 7" - can be smaller, but NO larger please! Contact Wingtip Press if you want to participate. 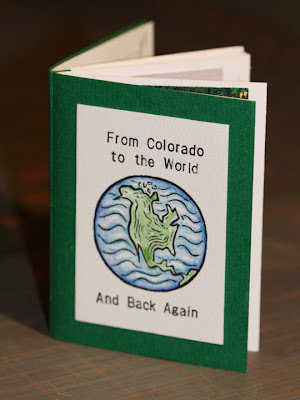 Last year, my printmaker buddy Sherrie York sent to me a little book in the mail: Jill Bergman's Little Print Book Project. Well, I was right in the throes of new mommy-hood, and was completely hopeless with pretty much anything at that point. I eventually managed to coordinate with other printmakers around here (Cowichan Valley, Victoria, and Richmond, BC, and Bellevue, WA) to contribute, then finally I managed to send the book off to AnniePod in Philadelphia, PA, who also sent it to Tuckamore Design in Buffalo, NY. You can see the final book at Jill's blog Art on the Page. Thanks to everyone who contributed; it was a treat to see all your pieces, and what a fun way to connect with other printmakers. Thanks, Sherrie for thinking to include me, and thanks Jill for getting the ball rolling in the first place! I hope your other books come back full of lovely prints and more contacts. PS - Jill is still looking for contributors - if you're interested, visit her blog for contact info. I've seen this now through Printsy, Facebook, Twitter, Printeresting, and a few other sources, so I just had to share. How exciting! Now, I just have to be able to find time & energy to get back into the studio! OK, so that leads to Mommy Update: we're all doing well, thank you. Kate is now 15 months (yikes!) and not quite walking everywhere but just about, with lots of proto-words and a lot of smiles & giggles. Get out your squeegees and spitstickers, resin boxes and liquid tusche, presses and barens, ladies and gentlemen it's International Print Day!! 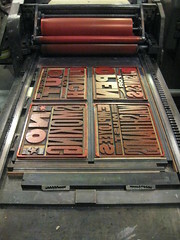 Whatever your printmaking passion, press on, boys and girls, and get some ink on paper today! Share what you've done - make a comment (although be patient; I've had to moderate comments because of all the spam) and send a link to your work from today. Share it with MPC Fine Art Club's printmakers on the Print Day in May blog (they're the group who got the brayer rolling back in 2007), and mark the first Saturday in May in your calendars for next year so that we can be a little more coordinated about it! I've put the above piece in this year's CVAC Fine Arts Show. All are invited to Cowichan Valley Arts Council's 41st annual arts show. It is the largest non-juried art show in the Cowichan Valley, featuring recent artworks by artists living and working in the Cowichan Valley. Gala Opening! Wednesday, April 6 from 7:00 - 9:00 p.m. Everyone welcome. Meet the artists and share in the fun. Thursday, April 7 Open 10:00 a.m. - 8:00 p.m.
Friday, April 8 Open 10:00 a.m. - 8:00 p.m.
Saturday, April 9 Open 10:00 a.m. - 5:00 p.m.
Sunday, April 10 Open 11:00 a.m. - 4:00 p.m.
Quw'utsun' Conference & Cultural Centre, 200 Cowichan Way in Duncan. Admission is $5 for adults and free admission for children. Your support of the arts and artists is greatly appreciated. Each day different CVAC members, artists and representatives of arts groups will host the show, giving demonstrations and talking about the art work. Please respect the copyright: the art work on this blog is original art work and the intellectual property of me, Amie Roman, unless otherwise specified (as I do feature other artists' original work) and as such protected by copyright laws. For more information see the World Intellectual Property Organization. Please be aware that the art work featured on this site may not be used in any way. If you wish to link to my original art work (or the art work of any other artist), please ensure to provide appropriate and complete credit (including links) to the work and the artist. Wanna join? If you have original, hand-crafted print material on your Etsy store, let us know! Wanna see who's Printsy this week? Click here for items just listed by our members. The one stop shop for any information on printmaking techniques, equipment, and artists!